It was 1986, I was fifteen and a huge fan of the DJ’s of the Dutch Radio Veronica. Adam Curry was my hero. As a big music fan, I wanted nothing more than to be a radio deejay. My love for music was probably caused by the band KISS, which I used to listen to when I was just an 11-year-old boy. They just looked so cool with their makeup and masks. At 15, I had outgrown my love for music bands and was obsessed with becoming a radio deejay instead. I was a huge fan of Adam Curry who presented the first real morning shows. While I presented shows for ten years, my talent was actually limited. Nonetheless, the radio shows I used to present contained elements of storytelling. And that’s where my passion for storytelling originated. During my years in college, I learned about the importance of facts and figures as well as structure and analytical thinking. 15 years spent in the corporate world added to this development. Yet, my passion for storytelling is as strong as ever and for the past 10 years, stories are once again at the center of my life. Being a father, a husband, keynote speaker, coach and author, my story was not made overnight. I am my story and have yet to reach the end of it. Both my successes and setbacks made me the man I am today – and the same holds true for companies and their leaders. I truly believe storytelling is the most powerful way to create a connection with your audience, and I see it as my higher purpose to educate companies on how to use stories to achieve their objectives. Thus, my principle is simple: If you want to change the world, you have to change your story. After having published my first book 4 years ago – No Story, No Fans – I have now published my second book: On Storytelling, leadership and the power of connection. In the past 10 years I’ve helped dozens of managers and directors create their leadership story. Because of my extensive experience and the results I was able to achieve, many leaders hired me to coach them. My book is based on this experience. While you may wonder if there aren’t already enough books on storytelling being published, my book is unique in that I cover the relationship between storytelling and leadership. Our world is ruled by facts and figures, our economy is still trying to catch up after the crisis of 2008, and every day we see ordinary people dressed in hoodies and sneakers change the world we live in. In this world, even leaders crave a connection. And the best way to achieve this is by making effective use of stories. After all, listening to and sharing stories has been part of our genes since the beginning of time. I wrote this book because I still find many organizations who struggle to use the power of stories. I wanted to make it crystal clear that storytelling is the oil that makes change processes run smoothly – in an ever-changing world. Storytelling must be used to inspire, motivate and engage both the people in your company as well as the business’ customers. But that’s not all. In my book I also offer 5 guidelines for effective storytelling: how to support data with stories, tell stories without the interruption of the ego, pull rather than push, listen to stories and leave fantasy to Hollywood. Never before was a book published in Dutch that both raises awareness of the need for storytelling for leaders and offers guidelines on how to use it effectively. Of course, there will be readers who want to know HOW to use storytelling concretely and how to apply the guidelines they read about in the book. While I offer the answer in my workshops and coaching sessions, it’s practically impossible to describe the answer in a book. A workbook might work, which in turn will lead to a personal development plan. A workbook is filled with exercises rather than reading material. With this book, I aim to take leaders by the hand and help them take the first step to personal development. The book was published on the 2nd of June and was attended by 70 people. Joan De Winne and Jef Staes supported the presentation with a short speech. Needless to say, it was a hit! This coming Thursday, a full article featuring the book will be published in the Belgian publication Trends Magazine. 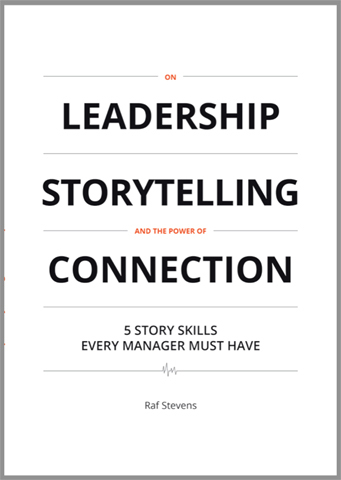 You can buy your copy of “Leadership, Storytelling and the Power of Connection: 5 story skills every manager must have” here. 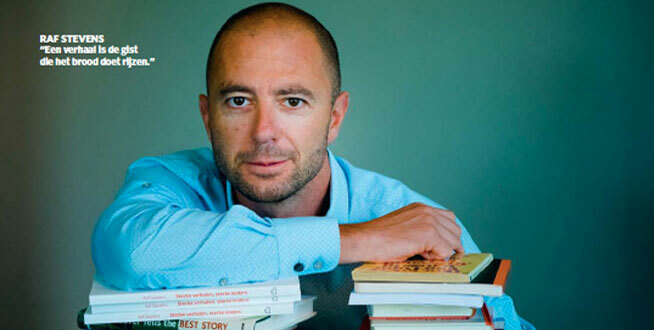 Raf Stevens is the author of Leadership, Storytelling and the Power of Connection and has over twenty years experience in communications. Ten years ago he decided to follow his passion: storytelling. Since then Raf has helped dozens of organizations and their leaders in the search for stories to create a stronger connection. He is a partner of Anecdote and a licensed Storytelling for Leaders® trainer. The facts were no longer there but the story was still remembered twenty (20 years) after my telling it. I’ve been telling stories to audiences since 1982. I know from experience it is the most powerful way to communicate a message.